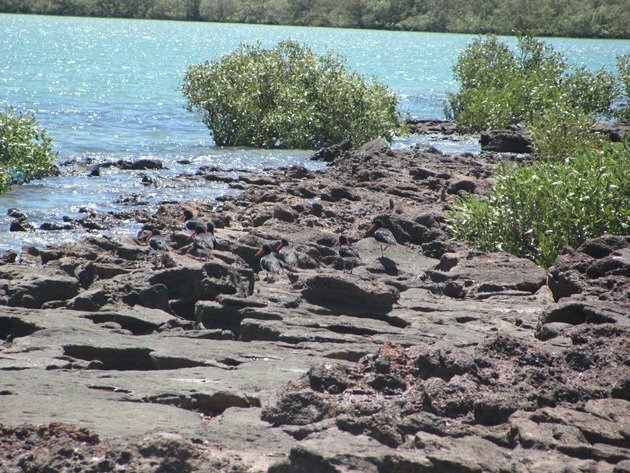 The closest place to Karratha to look for shorebirds is a small rocky area known as Back Beach where people regularly fish and use the boat ramp to go out into the bay. Once the tide drops there is mud exposed where we have seen the shorebirds feed, but we have found the most concentrated birds on high tide. 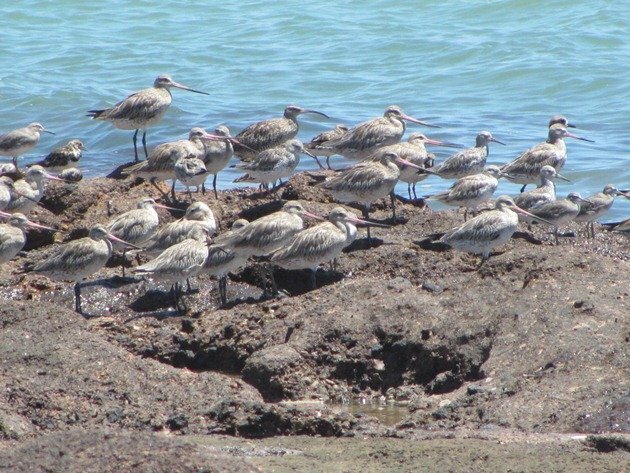 There were over 250 shorebirds there on a recent high tide and a nice mix of species. The road ends at the rocky car park and from there you will undoubtedly see a flock of Silver Gulls. 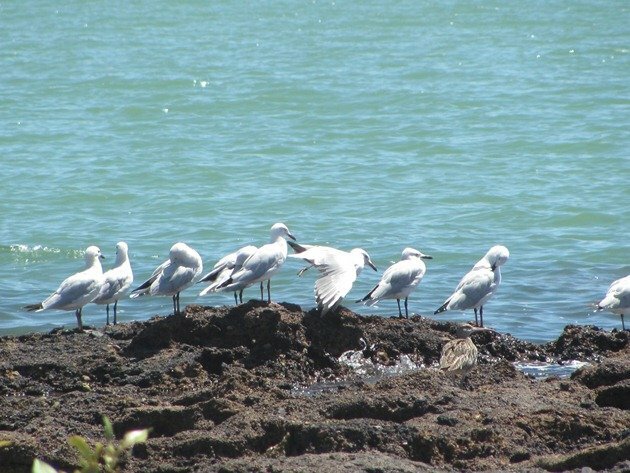 Look carefully, as there may be more than Silver Gulls…. We have observed over the years that Common Sandpipers love to place themselves in a shady spot during the high tide, which other shorebirds do not appear to do. 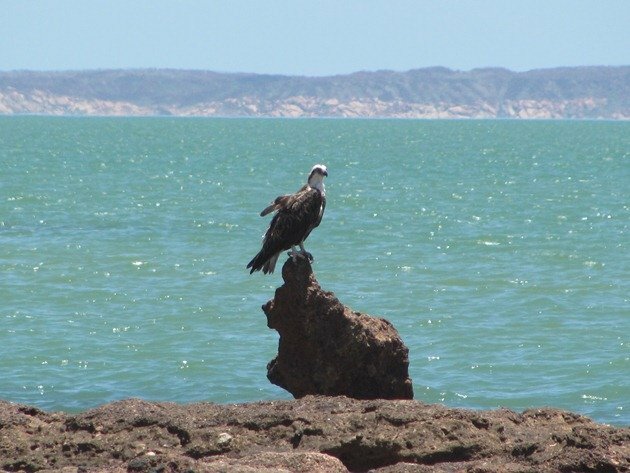 I wrote about this observation in the past at Barred Creek and we continue to observe it around the north of Australia. This bird was under the rock and we had not initially seen it, but it soon popped out with its bobbing tail. 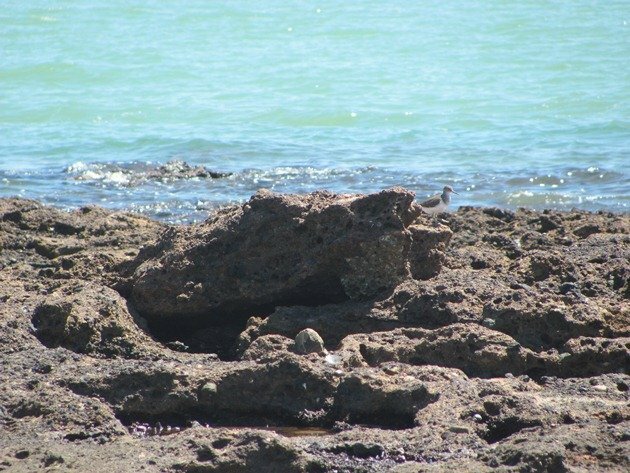 As we walked along the tide edge we suddenly realised we were being watched by 8 Pied Oystercatchers and they really were well camouflaged amongst the rocks despite their orange bills. The Pied Oystercatchers flew ahead and we suddenly realised that hiding a bit further along was a Sooty Oystercatcher, but it flew away across the bay. 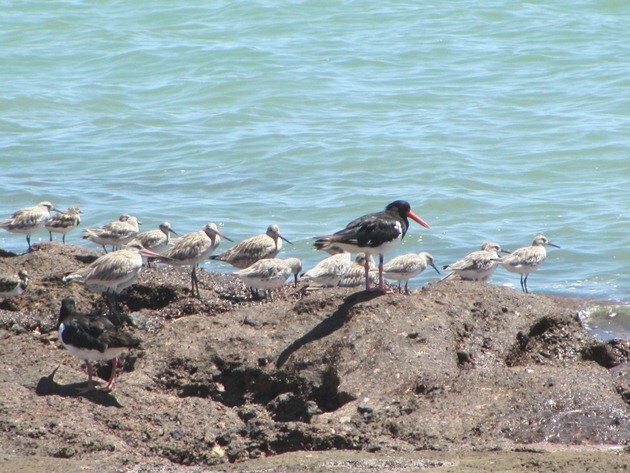 The Pied Oystercatchers joined a small flock of other shorebirds. Further along we discovered more shorebirds and there were more arriving to join the flock due to the presence of fishermen. The male Bar-tailed Godwit are already starting to show the change in their plumage as they prepare for their migration north to breed in coming months. The flock increased further adding to it Grey-tailed Tattler and Grey Plover on the right. 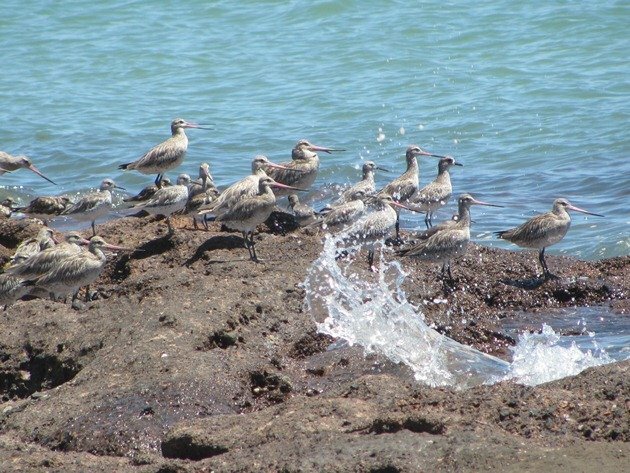 Our short walk at high tide had been very productive for shorebirds and also the sight of hundreds of Oriental Pratincoles rising through the thermals is one of the joys we experience in the north of Australia at the moment. 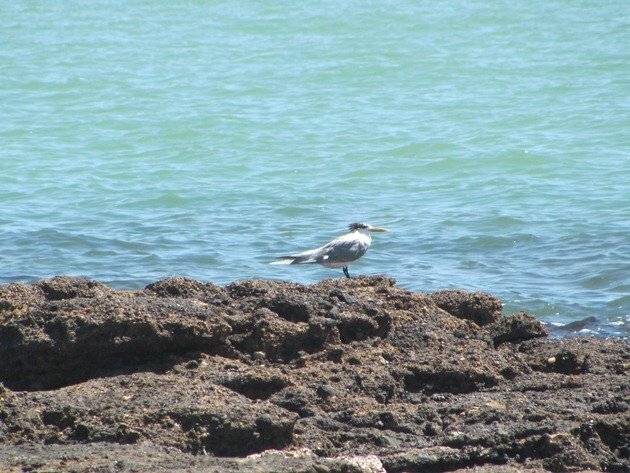 A Crested Tern was also roosting amongst the rocks as we headed back and a Caspian Tern flew by over the ocean. An Eastern Osprey was resting after consuming a substantial fish and another was continuing to feed on the nearby boat ramp. The Striated Heron that I wrote about a couple of weeks ago was at this boat ramp on low tide, so the area is productive for birds on both high and low tides. 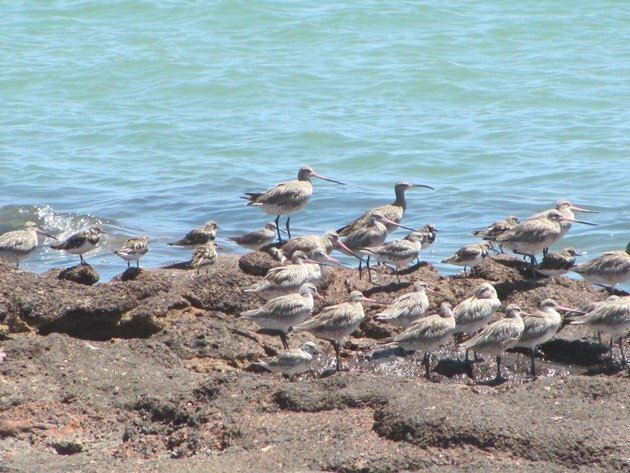 Our Karratha bird list was topped up to 101 after this brief trip to this small rocky beach near town, so there’s no complaining about the availability of different locations to observe birds around Karratha.